Typical Ingredients - sperlingjos Webseite! “Maìz” (corn) is perhaps the second most used ingredient, corn tortillas or chips are quiet commune. "Tamales”are the typical Christmas food, seasoned corn meal combined with some veggies, pork or chicken, wrapped into a banana leaf and than cooked in water, always prepared for big family tables. “Arroz de maìz”, literally translated rice made from corn, is a type of stew, dried corn cooked with chicken in chicken stock. My favorite corn preparation is called “Chorreadas”, fresh corn blended to a chunky consistency, seasoned and pan fried, little corn patties which I combine with salads, chicken or shrimp. “Platanos" (plantains) can be widely ripe and unripe. The ripe ones are sweet and widely used on all Costa Rican meals. Just lightly toasted in olive oil, perhaps lightly spiced with hot chili powder they combine perfectly with all rice dishes. 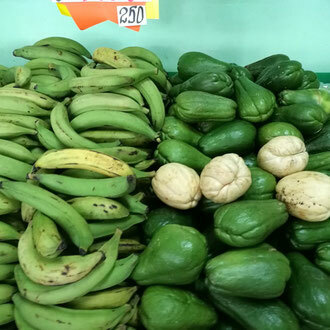 Unripe plantains are not sweet, can be fried and served as chips, or cooked in water and than mashed and used as a dough for “empañadas”, little puffs with different stuffings. “Patacones“ are a specialty of the Caribbean coast, unripe plantains are first cooked, than flattened and finally fried in oil, very pretty and delicious with black beans. “Chayote” is a remarkable vegetable because of it´s consistency. It does not have much taste, but absorbs all flavorings you add to it. Chayote is here mostly used in soups and “Picadillos”, finely diced combinations of vegetables, served on fish or just with a tortilla. Costa Ricans use chayote always cooked, for me raw it is best, the crunchy texture makes it attractive in salads. I prefer it combined with carrots, unripe (sour) mango and bell pepper with a ginger dressing and cilantro. 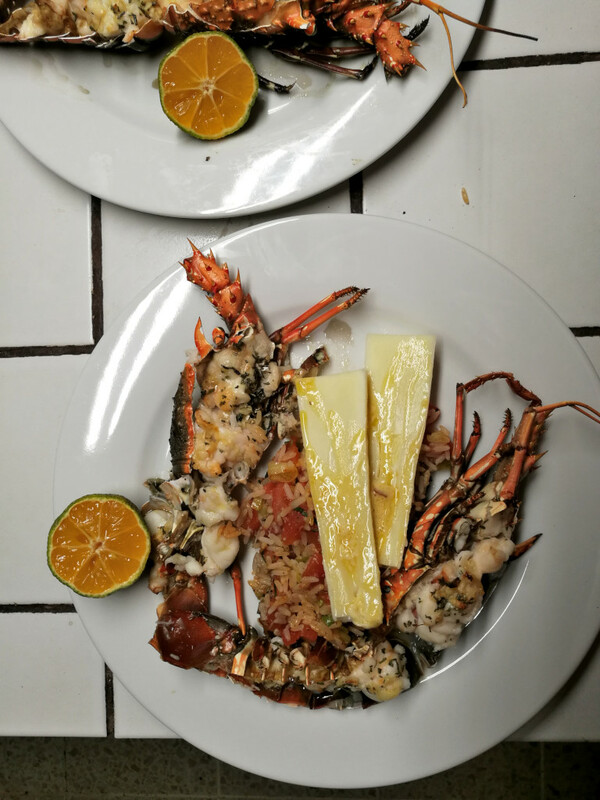 Also nice is to stuff the halves with spinach and cheese au gratin..
“Yucca” ( cassava, maniok) is a starchy root which tastes lightly sweet. I serve it either pan fried as chips, pureed as an alternative to mashed potatoes or as little cakes as a side dish for pork, fish or shrimp. 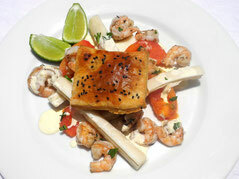 "Palmito" (hearts of palm) grow in Costa Rica, so we are lucky to get them fresh. Costa Ricans use them in salads, but I find them warm even tastier. I first boil them in salted water with a bit vinegar and serve them often with a Bearnaise sauce, they remind me of asparagus. Also very good is to slice them raw and saute, they turn out crunchy, similar to bamboo sprouts. “Chili picante” (hot chilies) can taste so different, not only hotter or less hot, specially “Jalapeños” and “Panameños” have such a delicate fragrance,that I use them all the time. And if someone does not like it hot, just remove the inside, seeds and the white parts. From the red ones I make hot sauce, from the green “Jalapeños” I make a homemade mayonnaise, truly special. 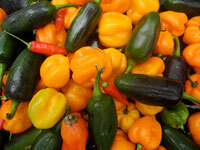 Imported from Mexico, “Chile chipotle” found it´s way into Costa Rican cook pots. Pretty hot and with an unique smoky flavor, it seasons sauces, specially gravies. “Pejibayes” are unique. The English name is palm peach, but they are really not peaches like at all, except for the color. They grow in huge clusters on a certain palm tree, more like nuts, starchy and fibrous and the taste is hard to compare with anything else. Here the people eat them with a bit mayonnaise and salt as a little snack. 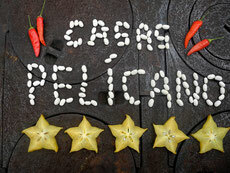 I often make a sauce or soup from Pejibayes or add them to rice dishes or fish and chicken. a super long bean, which can get up to 2 feed length. I always serve them in their complete length, makes them looking like a nest. "Aguacate" (avocado) we get here most time of the year. Mashed with garlic, lemon juice, salt, chile jalapeño and cilantro is my favorite type of guacamole. A sandwich with avocado, home made smoked ham, some green leaves and sliced red onion on homemade bread, healthy food can be so delightful. 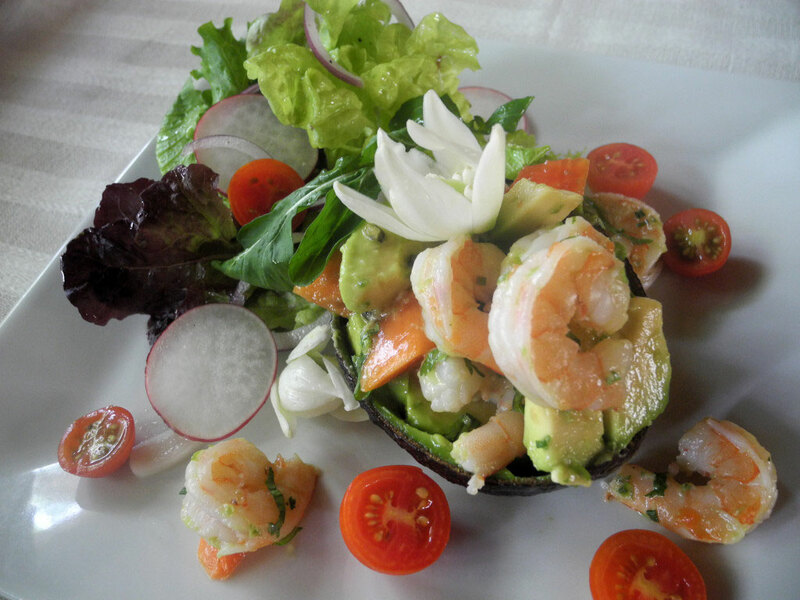 An avocado shell stuffed with shrimp, papaya and cubed avocado make a pretty starter. And there is even a surprising dessert made from avocado with orange and whipped cream. "Tomates” (tomatoes) you can get everywhere in the world, but here, where they are “at home” they are terrific and available during the whole year. No more canned tomatoes for me! Tomato sauce made from fresh tomatoes is so much better and so easy to make. Mean times I make even ketchup, without preservatives of course. “Pico de gallo”, a raw tomato salsa, combines perfectly with fish, shrimp, cheese or on tacos. 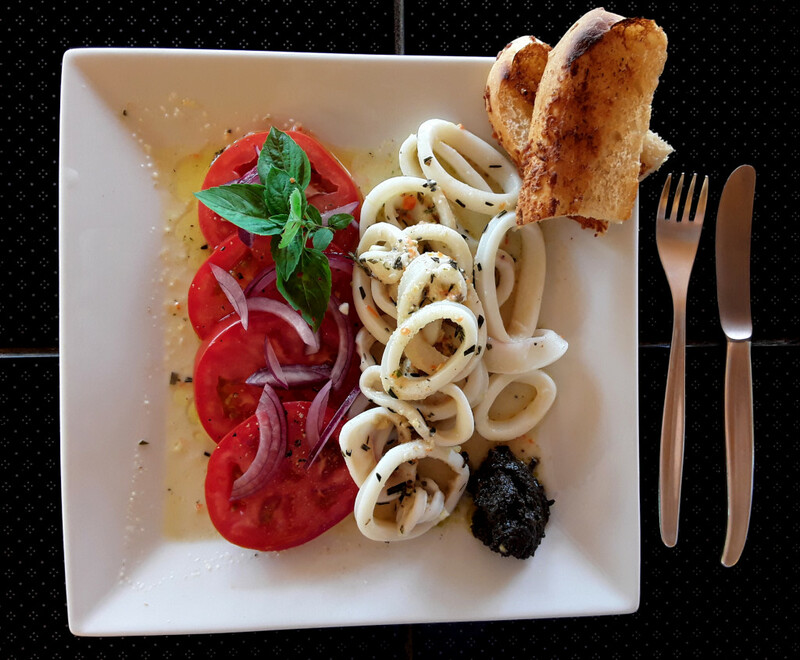 Tomato salad goes with anything, marinated calamaris for example. Basil, the classic complement, grows here like crazy and is very intense. 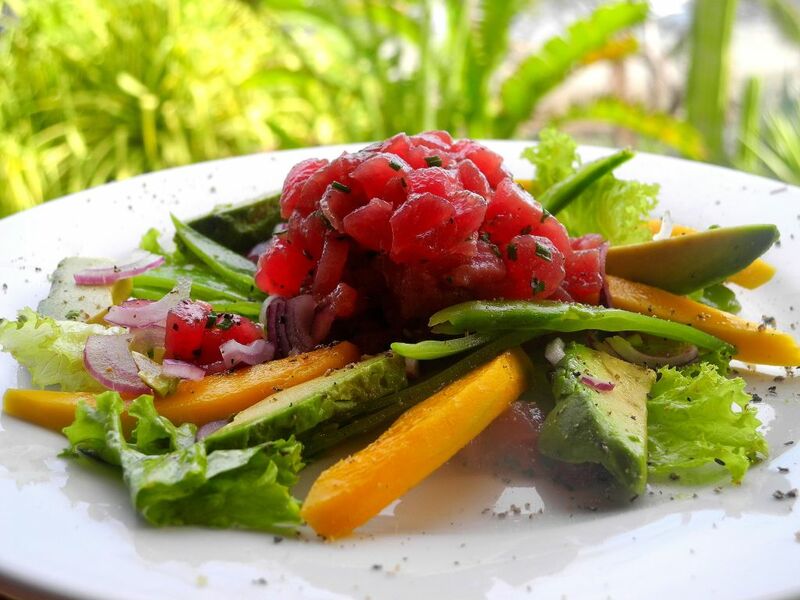 Salads are a week point in traditional Costa Rican cuisine. Most popular is just shredded cabbage and a slice of tomato and perhaps three slices of cucumber as part of the daily “casado”. No dressing, just boring. The reason might be, that in former times people had no refrigerators because there was no electricity, in Junquillal it was installed in 1985. For many years there was only one type of lettuce available, but recently we are lucky to have organic grown veggies in the area and they grow a variety of greens. In this hot climate I eat salad every day, I like to combine different leaves with all kind of vegetables, herbs and fruit. This country is so rich on excellent ingredients for most exiting salads. There is even an eatable white flower tree (“Flor de Itabo”) which tastes lightly bitter, is crunchy but most impressive are the beauty full flowers. One of my specials is a salad from julienn raw vegetables with a ginger dressing, combined with shrimp or chicken. “Achiote” is made from the seeds of a local tree. 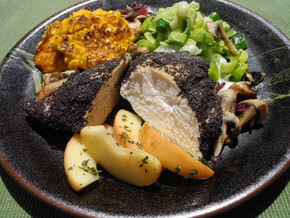 It does not havemuch flavor, but it gives a pretty color to chicken, meats , rice and white fish. It is available as a paste or liquid. Just add a bit Achiote to the oil in the frying pan. In former times, the Indians painted their skin with Achiote. 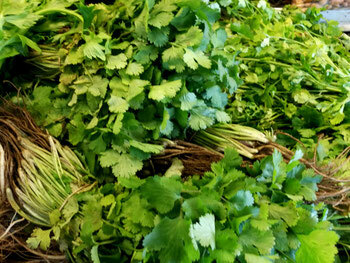 "Culantro” (cilantro) is definitely the most important herb in Costa Rican cooking. 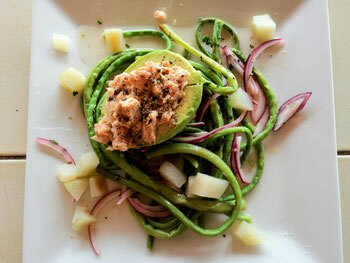 It goes with almost everything, a must on ceviche, rice dishes, vegetables.... 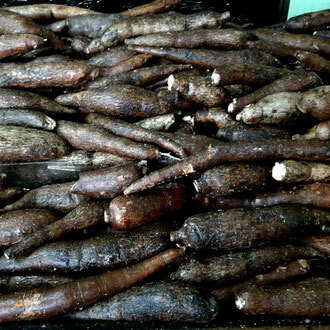 Here you buy it with the roots on it and the roots can be used in stocks and soups. Fresh cilantro is loosing much taste when you cook it.There is a second variety called culantro coyote witch tastes less intense. Strange for me was that the seeds (coriander) are not used in this country. "Oregano" grows easily, there is the normal one, an other with big fleshy leaves and one variety tastes lemony, great on fish or chicken. Oregano should be cooked for to get the full flavor. Lemon grass, ginger and mint also grow here, the locals used them as tea and drink it for medical reasons. “Papaya” has become one of my favorite fruit since I found out, that they must be really ripe and this is, when they look overripe from the outside. Papaya makes a great performance in salads, combines with shrimp or cabbage and even the seeds are eatable, they taste similar to horse reddish. A salad of grated green papaya is originally from Asia. As we have the same climate zone, all ingredients for this salad as ginger and cilantro are easy to get. A sweet papaya jam with some ginger brings tropical sunshine on the breakfast table and papaya&ginger cake has become one of my most successful desserts. "Maracuya" (passion fruit) grows here easily, a pretty climber with beautiful flowers. Frozen passion fruit mousse is very appreciated because it is so refreshing even after a sumptuous meal. 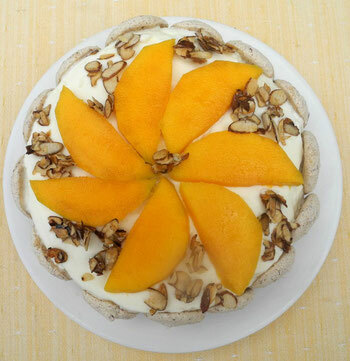 It gives a special kick to fruit salads and combines perfectly with the sweetness of mangos. 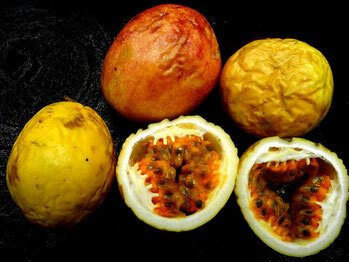 Passion fruit goes also with salty dishes, seasoning a sauce for chicken or even in a mayonnaise for raw tuna with spiral cucumbers on a taco. “Carambola” (star fruit) is so pretty, a slice looks just like a star. It is quiet sour, so I use it either in salad or prepare jam and cakes. The locals blend the fruit with ice cubes and sugar to make a “refresco”. 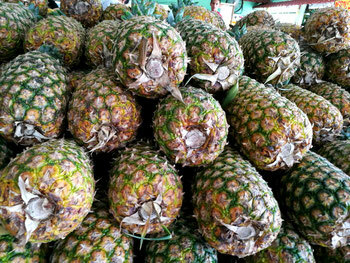 "Piña" (pineapple) grow in big on the Caribbean coast and we get them all year around. You can cut off the top (the leaves) and set it into the garden and it will grow and even produce a small fruit after one year. It is one of the most versatile fruits, you can use it raw or fried or baked, I make several kinds of cakes, a piña colada dessert or stuff crepes with pineapple. Add pineapple to a stir fry of different veggies and chicken or serve it fried and spicy with pork tenderloin, just great. “Tamarindo” (tamarinde) is a truly strange fruit, grows on trees, looks from outside like a big peanut shell and the eatable inside is a sweet and sour sticky pulp with some hard seeds. Here you can buy the pulp with the seeds in packages and the locals just put it in water for a while, than drain and add sugar for a refreshing drink. I love the surprising taste and use it mostly for to flavor shrimp or chicken sauce. “Mangos” taste like paradise even as the taste can change quiet well between once type and an other or even in one fruit you can have different parts tasting different. Everybody loves them. The main season is from January to July, later they are sometimes hard to find. When they are unripe and hard they have the right consistency for using in salads or as chutney or baked as cake, they turn out similar to apples. The ripe ones don't need any culinary artistic, they combine with all kinds of desserts and pureed with some passion fruit juice they make a tasty sauce . "Marañones“ (cashews) grow here, even in my garden. One nut on a very pretty fruit, which looks similar to a pear. The fruit is also eatable, but does not taste really good. 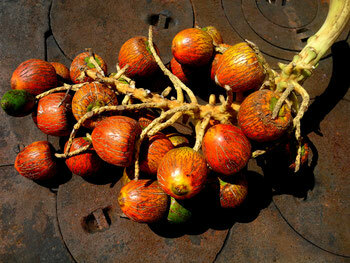 It is quiet a challenge to get the nut because it has an extremely hard and irregular shell. The shell needs to be toasted, than you can crack it and peel the kernel out. 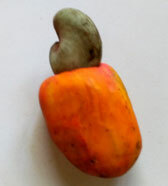 Additional it has a very bitter skin which needs to be removed before you can enjoy the great taste of the cashew nut. A lot of work, this is why they are so expensive. “Coconuts” are easy to find here almost through the whole year. On one coco palm tree grow several stages of development at the same time, flowering, small nuts, green nuts, which only have water (Agua de pipa) which you can drink. And finally the ripe nut. Grated ripe coconut moistened in water and than drained, make coconut milk, which is a good alternative to cream, specially for dairy free desserts. Coconut mousse or piña colada dessert are examples. On the Caribbean side of Costa Rica, rice and beans are cooked in coconut milk and I sometimes use the milk in sauces specially in Asian recipes. mahi mahi. Tilapia and trout, farmed in Costa Rica are always available and are surprisingly tasty. During the months December to April the offshore fishing season takes place. Shoals of sardines come near to the shore and are followed by bigger fish such as blue jack and “Jurel”, a red tuna, but less tasty. Ceviche is one of my favorite fish preparations, quick made and super tasty. All you need for the classic recipe is some fillets of white fish, about 2 pounds for 4 to 5 servings, 3 lemons or limes, salt, red onion, bell pepper and cilantro. In a bowl, mix the juice of 2 -3 lemons or limes with 1 teaspoon salt. Cut the fish fillets into small cubes and add them to the juice. Make sure that all the fish is under juice or add a bit more. You can see that the fish immediately starts to get opaque,. Cover the bowl with plastic wrap and put into the refrigerator. 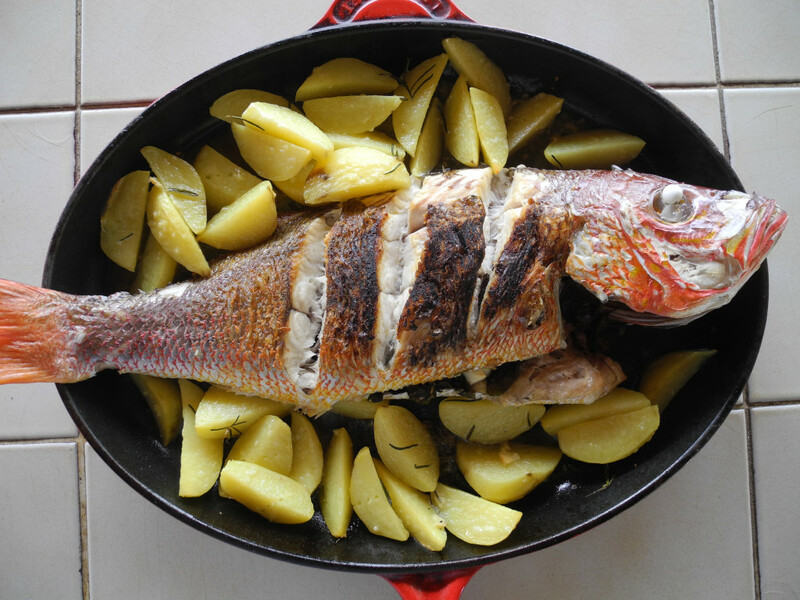 Check after ten minutes “cooking” time, depends of the type of fish you got. When all the cubes are opaque it is ready. Add one finely chopped red onion and one or two finely cubed bell peppers and some chopped cilantro. If you like it spicy, add hot chili to taste. Taste it and add more salt if necessary, in case you find it too sour, add some fresh squeezed orange juice. Serve chilled in glasses and accompanied by some chips from yucca, plantains or cornmeal, what ever you like. an invitation to be creative. Shrimp are really great. Even as I usually saute them or cook them in water for a few seconds, they are one of the most versatile ingredients. I feel so sorry for people with shrimp allergies. For entrees with shrimp I make a stock from the shells to use as a base for soups and sauces. A flavoring of tamarindo makes this sauce special for a rice dish with shrimp,“Arroz con camarones”. The classic Italian Spaghetti with shrimp turns out perfect, the wonderful tomatoes and the basil, just like in Italy. Costa Rican Beef, specially beef tenderloin is one of the best I ever had. Happy cows spending their lives at pasture day and night, enjoy half the year just fresh grass, during the rainy season. In the dry season they often look skinny and even miserable, because the grass is dried out and they need some extra food, but they are never ever so over feeded as cows are in other countries, where the purpose is just make quick money. You can taste the difference and the steaks are much cheaper compared to other countries. 20 years ago, the knowledge of aging beef was not really common. 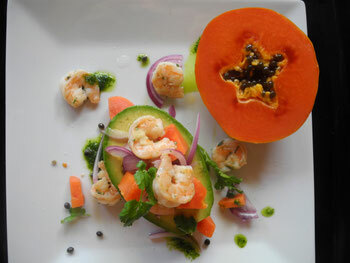 Many Costa Rican recipes recommend papaya as a softener, but it changes consistency and flavor in a strange way. There was a lot of progress in the last years and now we are happy to get a really amazing quality of beef. Other cuts I use for goulash or beef rolls. We also get really good pork. 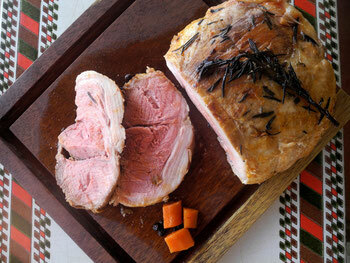 Pork needs only 24 hours for aging, so the locals often prefer pork. An other point is that they are afraid of eating rare ore medium cooked meats. During the times of electricity deficiency, often people have had a bad experience. Many Costa Rican families in the country side had a pig to butcher at Christmas time and a whole pork leg was and is still a traditional Christmas dinner. Mean times it is forbidden to grow pigs in the villages for hygienic reasons. We had one once. Lined with organic garbage from the kitchen and just the grass around, it was truly the best pork I ever had. "Pollo" (chicken) is very popular in this country. Many people have their own chickens and the eggs are really good, fresh and the yolk has an intense color. No birthday without “Arroz con pollo” and on a wedding or baptism whole chickens are cooked in water seasoned with all kinds of spices, than the cooking liquid has to been reduced and the chicken is served in this sauce, accompanied by potatoes, hard boiled eggs and some vegetables The every day chicken is mostly first cooked in water, than picked to pieces and combined with different kinds of vegetables, potatoes, rice....what ever is available. The shredded chicken is also used in stuffing for “Empanadas”, turn overs made from corn flour or unripe plantains, “Pastel de pollo” is a chicken pie and even chicken is prepared in Lasagne, Italians would be surprised. 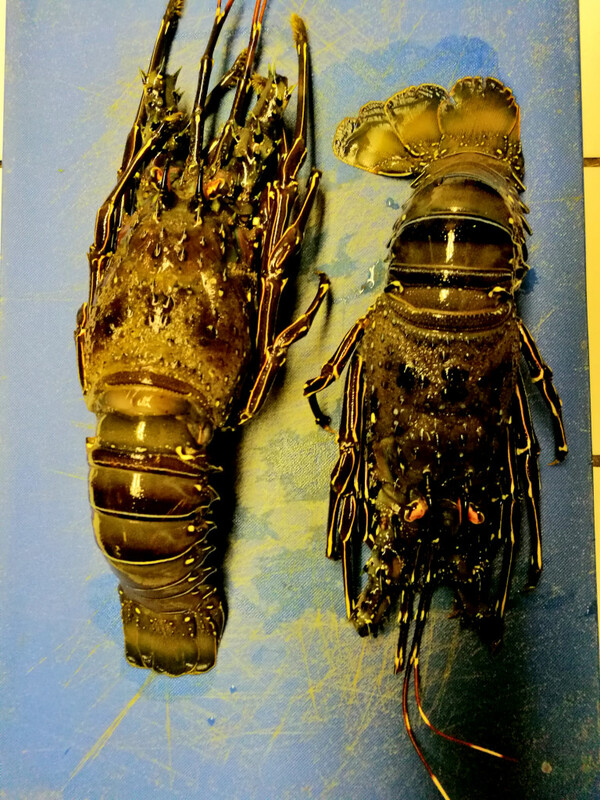 The reason why to precook chicken is certainly, that these animals lived outdoor and had to search for their own food running around, what made strong mussels, not tender meat. And often had a certain age before they ended up in a cook pot. I love chicken as well, using mostly chicken breast and many customers tell me that it is much tastier than what they get. Chicken is so often overcooked! When I prepare arroz con pollo, I fry slices of chicken breast without precooking and the result is quiet different. 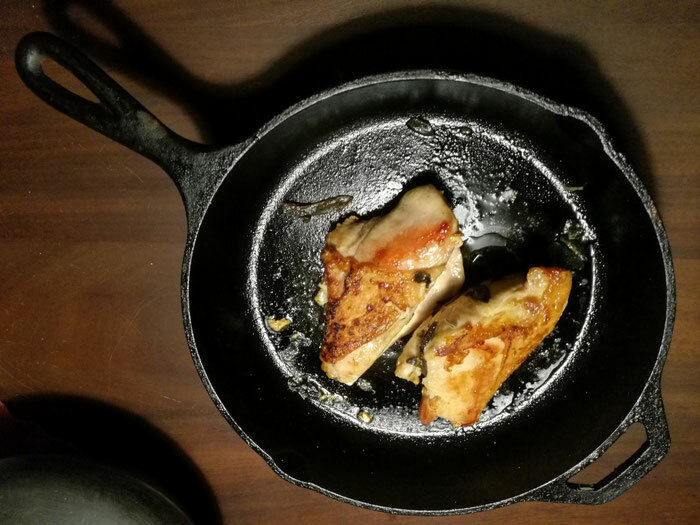 For me, the perfect way to prepare chicken breast, is to fry it in olive oil and bit Achiote and some fresh herbs in a cast iron pan, first meat side down for 3-4 minutes, than turn, season to taste and put the pan into the oven for about 15 minutes at 350ªF.. Check after 10 minutes, lifting the filet to look if the meat is white, that means the chicken is ready to serve. A well prepared chicken breast combines truly with everything. Other types of poultry are hard to find in Costa Rica, whole turkeys are available only from November to Christmas, ducks are too expensive for to become a regular dish. Surprising for me was to see sometimes gooses, but people have them not for to eat, just as guard animals like dogs.